2. Water deeply. Shallow watering promotes shallow roots. During hot weather the grass plant may not be able to absorb enough moisture even when the soil is moist. 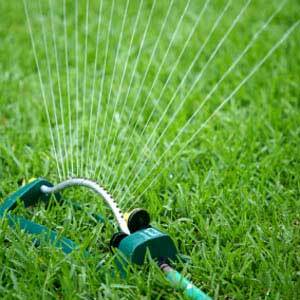 Put down 1/2 inch to 1″ of water each time you water. The easiest way to determine how much water you are putting down is to set out some tuna fish cans (or other straight-sided containers) and measure how much water you get over a specified period of time. 3. Water more frequently. If you water deeply (and you don’t have extremely sandy soil) you aren’t likely to need to water more often than every other day, even in the hottest weather. In cooler weather 1 to 3 times per week may be sufficient. How deeply you water should never vary. But the frequency will increase in hotter weather. 4. Water your lawn in the early morning while it is still cool. There will be less moisture loss to evaporation and less chance of disease. It is also less likely to be windy in the early morning, so the water goes on your lawn instead of the driveway. 5. Repair and adjust your sprinklers. Brown spots often occur during hot weather because your sprinklers do not cover your lawn evenly. Run each zone and make sure the spray patterns are reaching head to head and are adjusted to reach all areas of the lawn. Try setting a tuna fish can in both dry looking areas and in healthy green areas. Run the sprinklers and see if you are getting sufficient water in both areas. 6. Set your lawn mower blade higher in the heat of the summer (2 – 3″) to encourage deeper drought-resistant roots. The longer grass will also keep the ground cooler and require less water. 7. 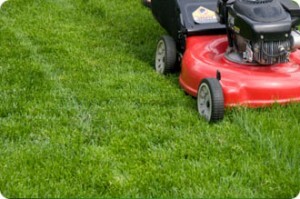 Keep the blades of your mower sharp to avoid brown tips on grass blades. 8. Prevent lawn grub damage. Damage from billbugs and white grubs often shows up just when the weather gets hot. It appears to be turning brown from lack of water, but may actually be from grub damage. Tug on the brown grass. If it pulls up easily with no roots, you likely have grubs. You may want to apply Grub Free Zone, Natural Guard Grub Control, or Milky Spore. Check with a consultant at Town & Country gardens for the best solution for you. Following these tips should help you keep your lawn looking lush and green, even through the heat of the summer.